NC State students lift a solar panel onto a roof for installation. 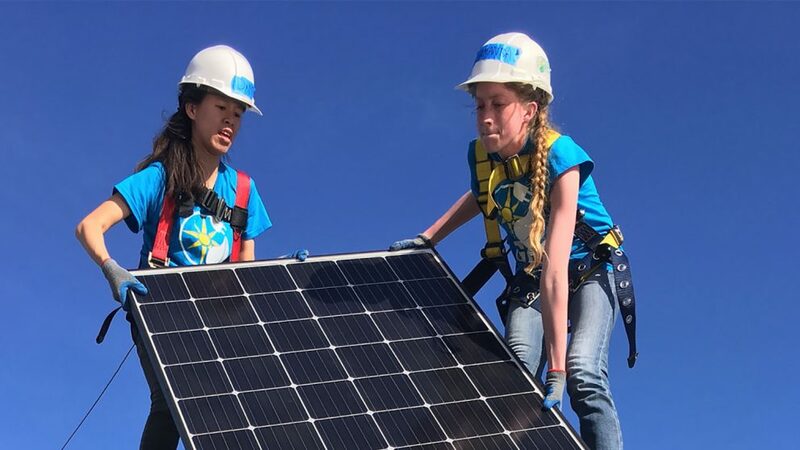 When student Elizabeth Wallner boarded the plane to California as part of an NC State Alternative Service Break trip focused on solar energy, she knew the physical impact that she and her team of 10 other students would have. Installing solar panels for low-income families would save money and improve the environment. But what she didn’t anticipate was that this week-long spring break trip would change lives. “It wasn’t until I was there face-to-face with the family that I truly understood the degree of our work; we were changing the entire future of a family,” Wallner said. 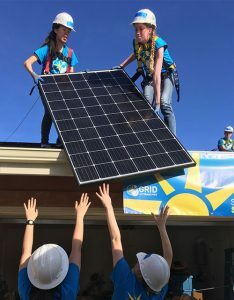 For a week, the NC State student team worked with non-profit organization GRID Alternatives to install two solar systems for families in the Atascadero community. By harnessing the power of the sun, the students help offset utility costs for low-income families for years to come. This was the first solar energy-focused Alternative Service Break (ASB) trip offered through NC State’s Center for Student Leadership, Ethics and Public Service (CSLEPS). Electrical engineering student Jackson Williams organized the trip after learning about the opportunity online. Williams successfully applied for solar spring break to become part of ASB, and he later received a grant from the NC State Sustainability Fund to offset trip costs for students. 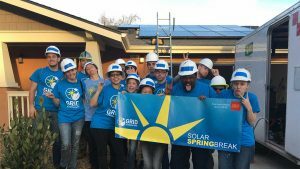 The NC State Solar Spring Break team after finishing solar installation on a house in the Atascadero, Calif. area. “For some participants, this trip was a way for them to get hands-on experience with solar power. For others it was about the social and service components of interacting with low-income families of migrant farm workers in California. For most, it was the unique intersection of the two,” Williams said. As WIlliams had hoped, the trip exceeded expectations. Williams hopes to secure a long-term partner that will allow the trip to become an annual offering of the ASB program. Published in Energy, Equity, News, Newswire, Students.